A-HOTEL.com - Luxury and cheap accommodation in Kostomarovo, Russia. Prices and hotel, apartment booking in Kostomarovo and surrounding. This indicative offer was derived from the most recently booked accommodation in Kostomarovo and sort by the price, from cheapest Kostomarovo accommodation to the most expensive hotels. To select accommodation by your preferences we recommend to choose from 1 accommodation offers in Kostomarovo in total. By entering the dates of your overnight stay in Kostomarovo and using the filter tools you can sort the best possible accommodation for you. The entered dates of your stay are crucial for the most accurate offer as it derives all the online information on pricing and availability of Kostomarovo accommodation. Then you can book the selected Kostomarovo lodging (hotels, apartments etc.) immediately. Set in Kostomarovo, Guest House Kostomarovo has a terrace. All rooms feature a kitchenette and a shared bathroom. 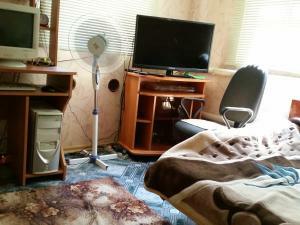 Located in Antipovka, Дача Забугорище offers accommodation with a balcony and kitchen. A fridge and kettle are also available. Offering free WiFi, Мотель СВ is located in Pavlovsk. The accommodation provides a 24-hour front desk. Boasting a bar and a restaurant, Motelik Khutorok is located in Losevo. All units in the motel are fitted with a TV. Situated in Aleksandrovka Donskaya, Noy Motel offers air-conditioned rooms with free WiFi. Featuring a 24-hour front desk, this property also provides guests with a restaurant. Lyudmila offers accommodation in Podgorenskiy. Guests can enjoy the on-site restaurant. Apartment on 1 Maya 50 offers accommodation in Pavlovsk. Guests benefit from free WiFi and private parking available on site. Hotel Don is set in Pavlovsk. The property offers a 24-hour front desk and free WiFi is available. Hotel Restaurant Rouz is situated in Pavlovsk. Among the facilities of this property are a restaurant, a 24-hour front desk and room service, along with free WiFi. Located in Zaoserednye Sady, Kak Doma Guest House features a garden. The property provides a 24-hour front desk. Guest House on Ivanovoy 5 is situated in Pavlovsk. All rooms feature a kitchen and a private bathroom. Set in Pavlovsk, Guest House Tai Tai offers free bikes and free WiFi. The property features barbecue facilities, as well as a shared lounge. Hotel Noah is offering accommodation in Liski. The accommodation provides free WiFi. Barocco LV offers accommodation in the centre of Liski, next to Miami mall Entertainment Centre. The hotel has a hot tub and ski storage space, and guests can enjoy a drink at the bar. Grand Hotel is set in Pavlovsk. Featuring a 24-hour front desk, this property also provides guests with a restaurant. Located in Pavlovsk, Domashnij Uyut apartment provides accommodation with a balcony and free WiFi. Guests staying at this apartment have access to a fully equipped kitchen. Mini-Hotel ''Granat'' is offering accommodation in Liski. All rooms boast a kitchen and a private bathroom. Grand-Hotel Express is offering accommodation in Pavlovsk. Both private parking and free WiFi are available at the inn. Hotel №1 on Gagarina Street features free WiFi and rooms with air conditioning in Pavlovsk. Boasting a 24-hour front desk, this property also provides guests with a restaurant. Set in Pavlovsk, Apartment on Svobody 28 provides accommodation with a balcony and free WiFi. Guests staying at this apartment have access to a fully equipped kitchen.